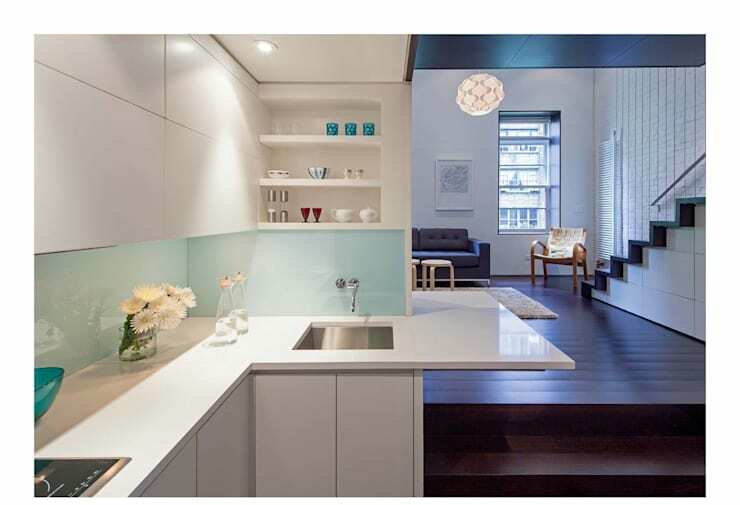 For lovers of the kitchen area, today we have modern ideas that are going to blow you away. These kitchen examples are beautiful ways to really make your kitchen the heart and soul of your home. It doesn't matter what size or shape your kitchen is or what colour scheme you go for, there are so many options available to you. As we explore these 10 amazing kitchen designs, we will see how the world is your oyster when it comes to kitchen designs. You can truly choose one that suits your personality and your home. These soft tones create a wonderful and homely kitchen, with the blue colours working in harmony with the white cupboards and shelves, creating a dreamy look and feel. This design captures the eye straight away! 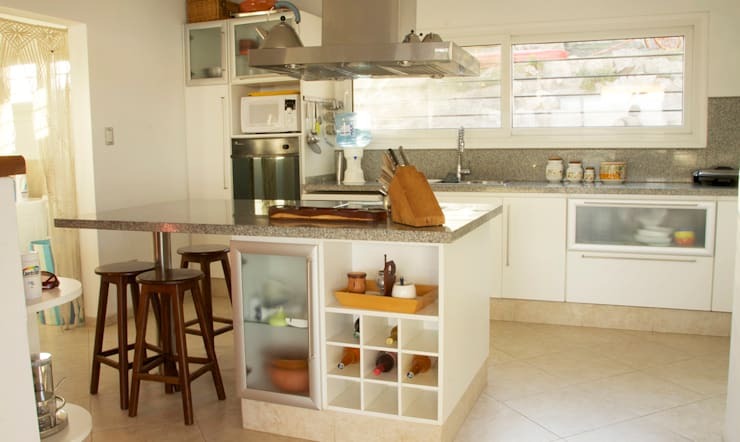 There is also an abundance of storage space, which fit into the kitchen in an L-shape. This includes shelves and cupboards, where items can be stored neatly out of sight or put on display. Tip: Add a fresh vase of flowers to your kitchen for a beautiful and natural touch! This kitchen takes on a whole new ambiance with the lighting chosen for this space. 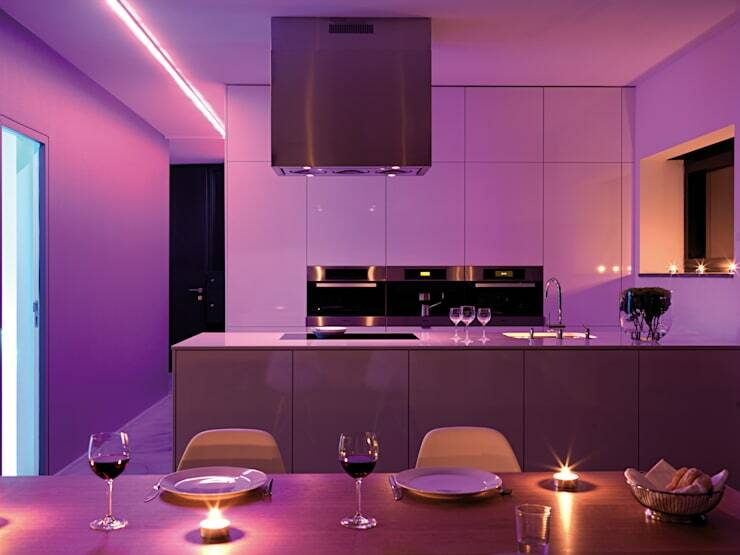 The designers have chosen purple lighting for the kitchen, which creates a wonderful soft glow in the evenings. It also works in harmony with the large, square cupboards and kitchen cabinets, resulting in a very dramatic look and feel. There is also plenty of storage space, keeping a sleek and minimalist design in tact. 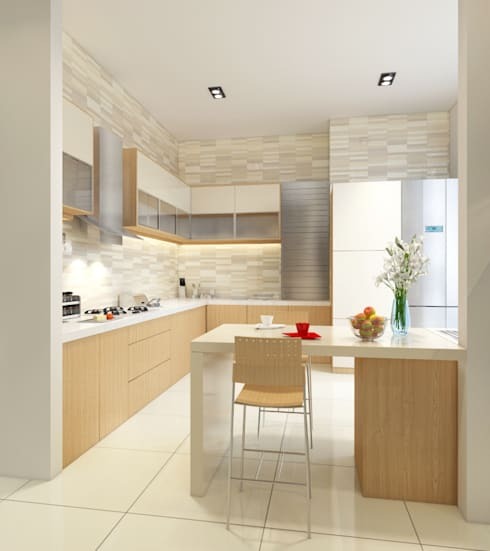 This very modern kitchen employs very sleek white tones, combining functionality and style. You'll notice that the sleek white design is enhanced by the silver lights that drop down from the ceiling, which add a little bit of an edgy look and feel to the room. The white marble counters are very luxurious and elegant and are a great material for any kitchen. Combined with a kitchen island, you have the most ideal kitchen area with plenty of storage space and surfaces. Kitchen islands are a wonderful addition to any kitchen, bringing that extra little something to it. Have a look at these other kitchen islands to treasure for inspiration for your own home! 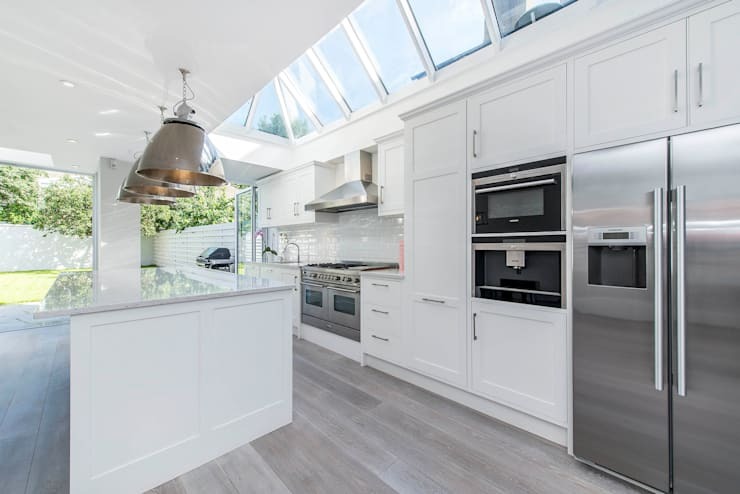 Natural light is always a great addition to a kitchen, filling it up with sunshine and even some fresh air. 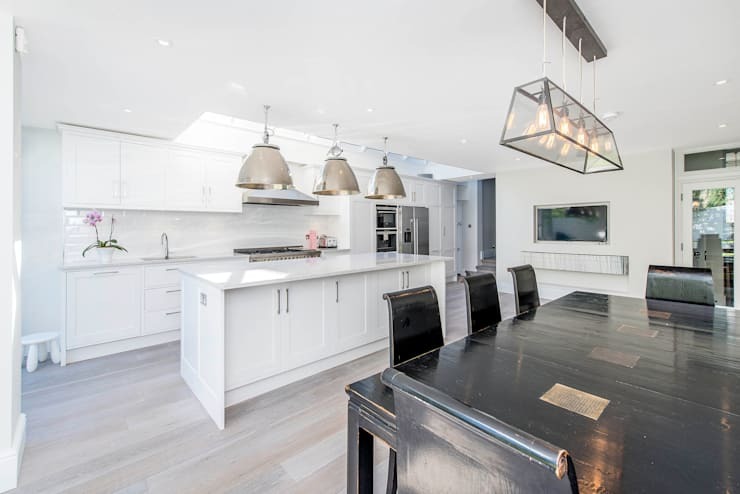 In this design, by professionals Cato Creative, we can see how skylights in the roof bring a beautiful and refreshing look and feel to the kitchen, working in harmony with the white tones. The volume of the roof makes the room look that much more spacious too! In this kitchen, we can see how it opens up onto the rest of the home in a very sophisticated and trendy open plan design. The designers have placed a bookshelf next to the kitchen, which features the same wood that we find in the kitchen, which creates a wonderful continuity between the rooms. This makes the home seem that much bigger. The wood used for the counter tops also brings a warm and rustic touch to the space and can be a lot cheaper than other materials such as marble. When you have multiple purpose cupboards, drawers and shelves, a modern design is the best option. In this image, we can see how the designers have gone for a kitchen island, which features drawers, shelves and cupboards. Some of the shelves are open, allowing certain items to be put on display. The other cupboard is enclosed with a glass door, which create a transparent barrier between the contents of the cupboard and the rest of the kitchen. 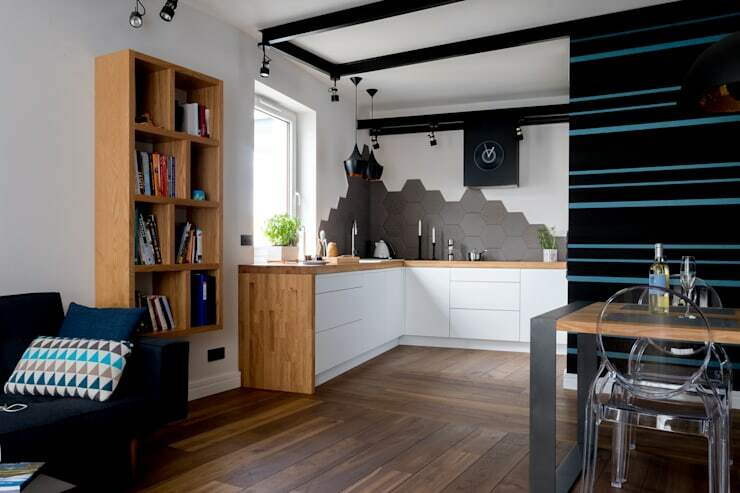 This storage space fits in perfectly to the style and design of the kitchen itself. Don't you love the little wooden stools that slot in under the breakfast bar? 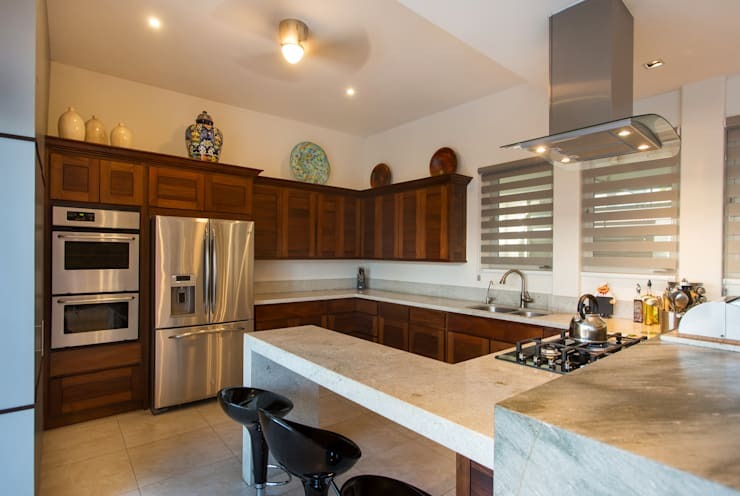 This kitchen features wooden cupboards with marble counter tops, which creates a very warm and inviting kitchen that is full of life and soul. These warm colours work wonderfully in this space, while the glass cabinets allow some of the kitchen items to be kept on display. Paired with silver appliances, this is a very sleek and savvy design! 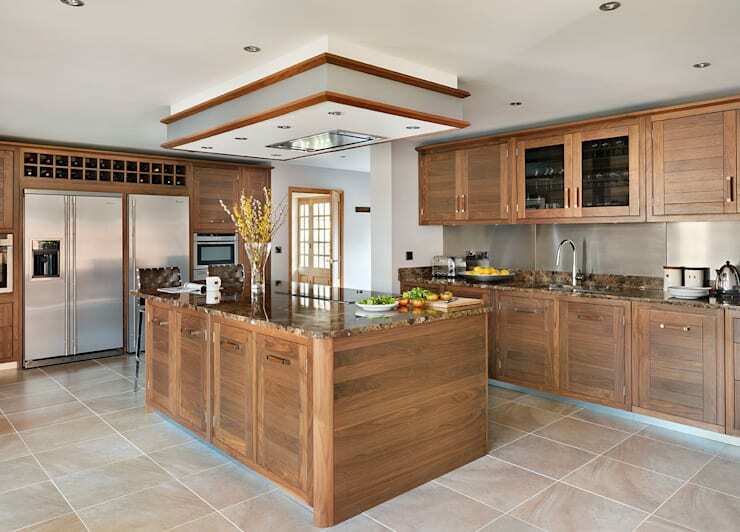 In this design, we can see how the wood works in a larger kitchen as well as how it combines beautifully with other materials. The combination of wood, marble and silver is simply gorgeous. Glass cabinets are a very modern design and as we can see in this image, combines aluminum with glass. This works incredibly well in a medium sized kitchen. The LED lamps reflect the glass, creating an idyllic fantasy kitchen that evokes sophistication and elegance. This also illuminates the details inside the cabinets, which creates a very appealing look and feel. It also makes it much easier to find what you are looking for in the cupboards. 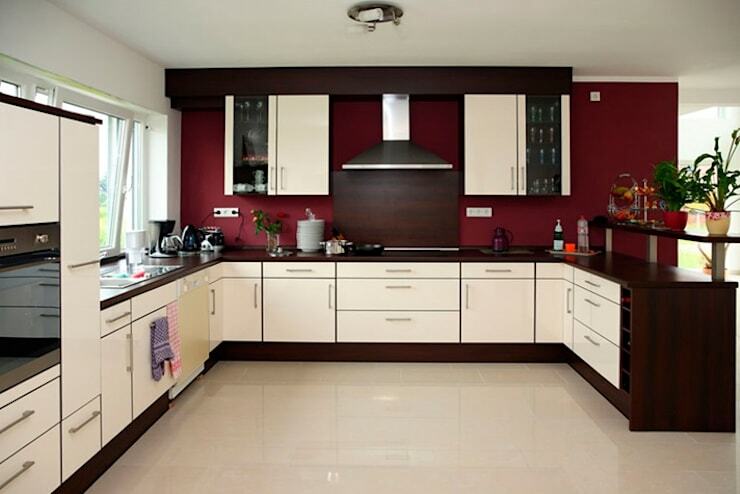 Don't you love how the textured walls bring in harmony with the light wooden cabinets and white counter tops? Here how we can see how the glass cupboards have a slight tint to them, contrasting beautifully with the white and purple tones. These cabinets and shelves highlight the beauty and sophistication of this space, with the bright yellow tones enhancing the whole look and feel of this space. The upper cabinet is closed, while the shelf below it is open, fitting all sorts of cutlery and crockery on it. The yellow tones also work in harmony with the black, white and grey patterned wallpaper, packing quite a punch! Also have a look at this ideabook: rural style: 10 easy kitchen ideas. Which kitchen is your favourite?